Internal and external factors—from the economic environment to investors and leadership—drive the valuation and strategy of a media company. EBay founder and philanthropist Pierre Omidyar founded Honolulu Civil Beat with the intention of it using a for-profit subscription model. But as Civil Beat Editor and General Manager Patti Epler explains in this case study, public reaction changed the nature of its business. Patti Epler, at a Civil Beat staff meeting. When you’re sitting on an island in the middle of the Pacific Ocean, you think a lot about what it means to be part of a small community. Public trust. Relationship building. Accountability. Giving back. These are the cornerstones Honolulu Civil Beat is building on as we continue to grow our independent news outlet here in the islands. Since startup in 2010, we have evolved our business model to reflect not only our particular place in Hawaii’s media landscape, but also who we are and what kind of civic partner we want to be. It’s really the model of a small-town news organization, even though we have a statewide reach and, often, national aspirations. We believe news is a public asset. Civil Beat was started by philanthropist and eBay founder Pierre Omidyar, who has long advocated for a free and independent press as a critical piece to a healthy democracy. Civil Beat was his toe in the water that eventually led to many efforts across The Omidyar Group— a collection of social impact companies, organizations and initiatives — to support all aspects of journalism. His experience with Civil Beat helped inspire First Look Media, a national organization consisting of reporting from The Intercept and other news, film and audio projects. Civil Beat launched as a for-profit, subscription model with startup support from Omidyar. The idea was that Hawaii readers would embrace the kind of investigative and watchdog journalism that had long been lacking in the islands. We thought that it wouldn’t be long before we had enough $19.99-per-month paying customers to break even. No click-based advertising — just subscriptions and possibly some corporate sponsors of our big projects. It didn’t work out that way Civil Beat fairly soon came to grips with what it means to be a small news site in a place where the cost of living is higher than in most large American cities. We found that 20 bucks a month for an online news site was a bit of a stretch for the broader community. Businesses got a better bang for their buck from buying ads on TV news or from the statewide newspaper publisher and its spinoffs than from sponsoring our projects. Meanwhile, we were doing the kinds of stories that no other news organization was even attempting. Our reputation for journalistic excellence was growing, and our impact on policymakers and public policy was phenomenal. Our findings were regularly cited by key political and civic leaders, showing up in reports and studies and even being written into legislation as the basis for reform efforts. We won a lot of awards, including being named the best news site in Hawaii every year of our existence by the Society for Professional Journalists. That helped us build a readership that was highly educated, well-heeled and skewed older. While the price of a monthly subscription was quite doable for these folks, a readership survey in 2014 showed that these readers were also subscribing to numerous publications — The Wall Street Journal, The New York Times and The Economist, to name just a few. Our subscription base continued to grow — but very slowly. Our metered paywall – which allowed readers to view a few articles for free before charging them – didn’t help either. It was so porous that most people could access enough of our content regularly, and they didn’t even really need to subscribe. We dropped our price a few times, and after five years we ended up at $4.99 per month. In 2016 — six years in — we decided to embrace what we had become: a mission-based news organization that eschewed a larger retail strategy. We were in it to help Hawaii become a better place, as we had said from the beginning. Along the way, we hired experienced — and higher-priced — journalists who joined Civil Beat because they could do excellent journalism without the dark shadow of budget cuts. 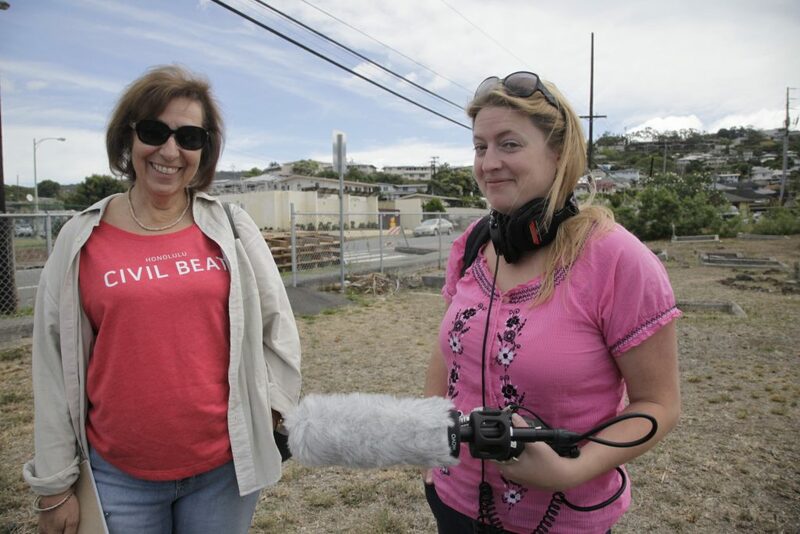 Patti Epler (left), out on an interview for Civil Beat’s Offshore podcast with host Jessica Terrell (right). As it turns out, people in Hawaii really do value the kind of journalism we are doing — independent, investigative and explanatory public affairs reporting that takes people inside the issues and seeks to hold public officials accountable to their citizens. We managed to hold on to most of our paid subscribers, who converted to monthly memberships. And we have gained hundreds more grassroots donors. We launched our first-ever year-end fundraising campaign on Black Friday 2016, with an ambitious goal of raising $50,000 in grassroots support. Led by a $10,000 matching grant from the EACH Foundation, we reached our goal in just a few weeks, prompting us to stretch our goal to $75,000 raised by year-end. In the end, we surpassed even our stretch goal, raising a total of $84,000. More than 1,000 Civil Beat readers made donations during our campaign. The average monthly recurring donation was $12 in the spring of 2017 — double the average subscription amount. In the first year since our nonprofit transition, we’ve secured $200,000 in grants from community foundations. Some money came from the charitable arms of businesses whose marketing departments found it tough to help offset reporting projects when we were for-profit. 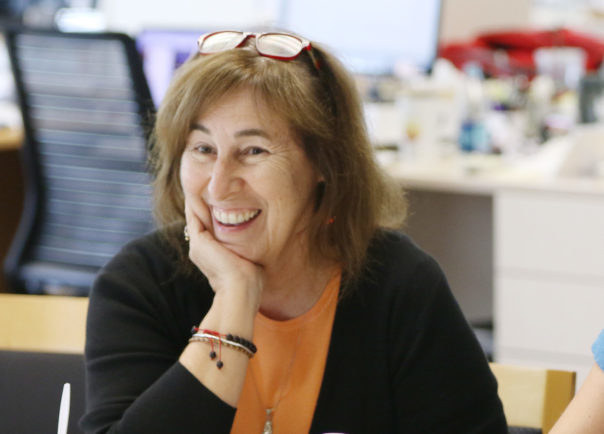 One grant is funding a full-time education reporter for two years, possibly three. More donors are specifically helping underwrite environmental reporting efforts. We list all of our donors on our website. And we make clear that donors — whether individuals or foundations — understand the strict guidelines that accompany their monetary support. The guidelines, developed in conjunction with the American Press Instituteand the Institute for Nonprofit News, state that funders will have no influence on the content of stories. The outpouring of community support has changed us in ways beyond economics. It has made us realize that if the community is going to support us, we need to support the community — beyond just publishing stories on the website and social media. We need to work harder than ever to maintain public faith in us and trust in our journalism. We need to be transparent and accountable to readers and donors. We understand the importance of being a good community partner — not just an arms-length observer recounting news of the day. We have a stake in this community as much as it has a stake in us. And, to be honest, the more we do in the community, the more we develop new readers who become new donors. Civil Beat has always fancied itself as a virtual town square, a place where all sorts of people can feel comfortable expressing their views. We have worked hard to build a community that includes robust commenting on our stories, along with a Community Voices op-ed sectionthat is open to many diverse points of view. We’ve also held community events for years. They started as panel discussions held in our newsroom, but became too big to suit the fire marshal. For the past few years, we’ve taken these Civil Cafes and Hawaii Storytellers out to the community, finding venues that accommodate more people. But becoming a nonprofit underscores our mission to educate and engage the community even more. We have expanded the kinds of events we do, plus we are doing more of them. We’re even helping other nonprofit community organizations with their events, sometimes through a financial sponsorship or support with program content and publicity. In the spring of 2017, we launched a series of news literacy events in partnership with the Hawaii State Public Library System. This grew out of one of our new “member coffees,” where we invite people to come to the newsroom once a month to talk about Civil Beat. One woman wanted to know how she was supposed to figure out what news sources she could trust. So we worked with the Center for News Literacy at Stony Brook Universityin New York to develop a curriculum for events and a resource page for our website. We now livestream as many public events and press conferences as possible. Our Facebook Live audience is growing and appreciative of the opportunity to watch discussions and news events they otherwise could not access. Two webcams we set up — one that allowed people to watch an endangered monk seal raise her newborn pup on a crowded Waikiki beach and the other overlooking a Big Island volcanic eruption — drew tens of millions of viewers worldwide. We continue to find other ways we, as a news organization, can support the community. Last year we launched a new internship program for young journalists in Hawaii. We accept both college students and recent graduates into a year-long “urban immersion” program, where they get hands-on training as community beat reporters. Our first cohort included three reporters and a cartoonist. Our social media team has developed a training program for other nonprofits that want to learn how to use social media tools to help their organizations. Our journalists moderate or appear on public panels for a variety of organizations. We speak to a lot of college classes and local civic groups. We’ve made our podcasting sound studio available to anyone who wants to use it to record their own programs. A new initiative we’re calling Journalism Plus starts with our journalism but takes it a couple steps further in an effort to give back to the community. For instance, we’re helping women in a local prison produce their own podcast and translating our Hawaii Civics 101 series into Hawaiian and distributing it through schools. On the news side, we have expanded our coverage to the neighbor islands, lining up a columnist on Maui, Kauai and the Big Island. We have planned or conducted community events on each of the islands. We added a full-time reporter in Washington, D.C., because the federal government and its spending are so important to Hawaii. We are the only Hawaii news outlet with a full-time presence in the nation’s capital. Today, the Civil Beat budget has grown to more than $3 million. Pierre Omidyar is still our major funder, but community support is allowing us to expand our staff and our reporting efforts. We’ve grown from a startup with six reporters and three editors to a newsroom that employs 18 full-time journalists — reporters, editors, photographers, multimedia and social media editors. In addition, we have a number of paid freelance columnists, many of them longtime and well-known observers of life in our islands. We have four people on the business side, including a full-time director of philanthropy and a full-time events and membership manager. In 2010, we had no idea what would happen with our media startup. But startups are, by definition, places to experiment with new ideas. We’ve certainly done that — sometimes with success, sometimes not so much. We intend to keep trying. But one thing we have learned is that the strength of any nonprofit organization flows from the broad support of the community. It is important that we are very much a part of Hawaii’s civic framework. 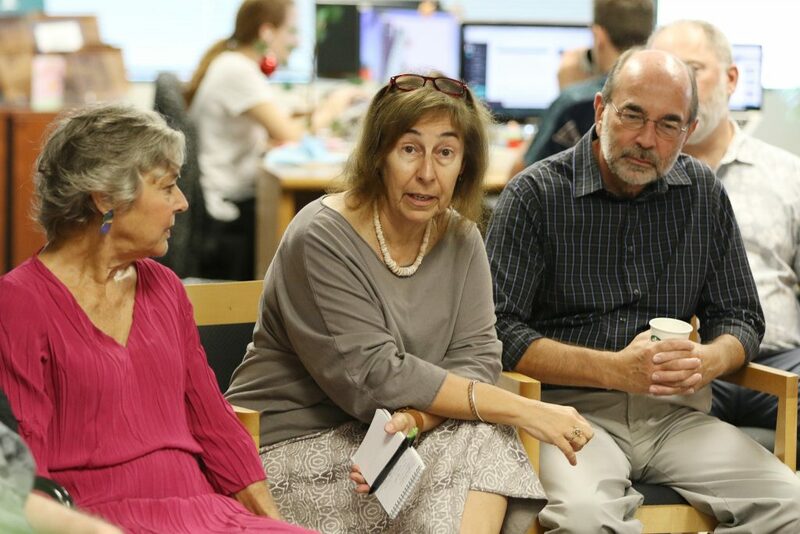 Patti Epler hosts a member coffee meeting in the Civil Beat newsroom.